The 17th annual National Online Recruitment Aawards will be held on Wednesday 15th November in London. This award ceremony is entirely dedicated to the continual improvement and evolution of the candidate experience. Throughout the past 17 years we have seen the focus of progressive employers, recruitment firms and job boards change to recognise that. This event views the recruitment sector from the perspective of the jobseeker, and aims to shine a light on the very best examples of excellence in our industry. As the definitive measure of the standards now expected by candidates, we expect the finalists and winners will continually be inspired to strive for better. If you’ve never been to the National Online Recruitment Awards, here’s a peek at what you’ve been missing. With over 300 people drawn from right across our industry, the NORA is proud to be unlike any other awards event. 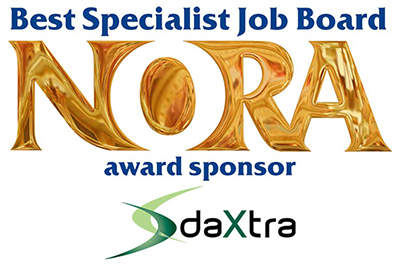 DaXtra is proud to sponsor the Best Specialist Job Board Award.